Life in a Group Home: Who Needs a Fancy Curtain Rod?? When we first moved in, we noticed the curtains on the guys' side right away. Well, I guess I should say window coverings. 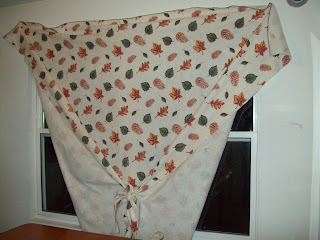 In the kitchen, there is a big fleece blanket hung with thumbtacks. 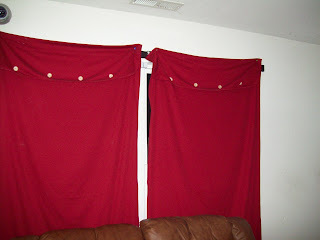 The living room actually has real curtains, but they're velcroed to the wall. (Apparently a lot of these consumer-served homes have velcro curtains.) It's not the most aesthetically pleasing way to hang them, but it's better than getting whacked on the head with a big curtain rod when they are pulled down. curtains in the kitchen so we can open them during the day. He promptly demonstrated how to rip up the sides of the blanket to make your own tie-backs. So, instead of having light come in the middles, it comes in through the sides. It's interesting. He's offered to come over to our side of the house and bring his curtain-making talents. So far, we've resisted the temptation.